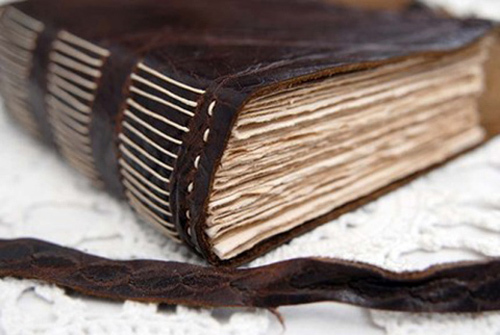 Words, longings, passions and memories belong on the pages of Louise's beautifully handmade journals. They beg to be written in, and are offered as a resting place for the world of words within. Each handmade book is woven from re-purposed objects from everyday walks through Louise's life. The lavish blank pages are ready to meet the pen. Her journals have respect for the written word and the images they portray. They are a gift to yourself and your dreams ... How could you refuse such an invitation to plant them out here in the world ... ? Bibliographica is the home of unique hand made journals, botanical photography and exciting costume jewelery. Bookbinding, collecting the materials to make my journals (and the stories I collect along the way), photographing botanical specimens and creating collage with them. I love handmade because it is hands on. I am greatly inspired by the likes of Henri Cartier-Bresson and Karl Blossfeldt in photography, Annie Dillard as a writer, world music sounds such as Baka Beyond, Ravi Shankar and John MacLaughlin. I love National Geographic magazine, going to flea markets, bric a brac stores & finding treasure in someone else’s trash. I feel immensely liberated by places such as Etsy, Felt and sites which promote and support the art and craft market – I feel blessed to be born into the information age! I have met and interacted with some incredibly talented people through this venture which is very exciting. Photography, the conspiracy theory (if I am not too tired), bookbinding and adventure travel. My creative life is my life. That would be telling… although I’ll reveal one. 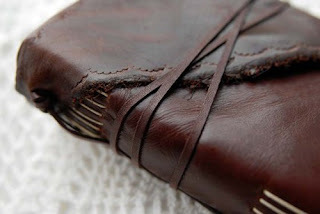 I’ve missed a stitch while Coptic binding before and had to take the whole book apart and start again… and when you are using 8 needles, are almost finished and find your missed stitch is at the beginning… this is testing! My kitchen table is now my studio work table. I don’t sit at the kitchen table, which has been replaced with a vintage school desk from the 1950s complete with a flip top lid. It houses a plant, some incense and usually some mail, and I don’t sit there either! Bologna, Paris, Prague… Learning to rock climb and subsequently climbing a really big rock…then looking back to see how far I have come. You can find Louise at her blog, etsy and felt. It is great to hear more about Louise. I love her books, they are so...tactile! Informative and interesting, yet maintaining an air of mystery.. not unlike Louise's beautiful work. Awesome, so cool to hear more about you and your beautiful craft!! Great to know you are following your bliss!